Sometimes you try something that you're just sure will never work, yet somehow, even though you almost can't believe it, things work out just perfectly. 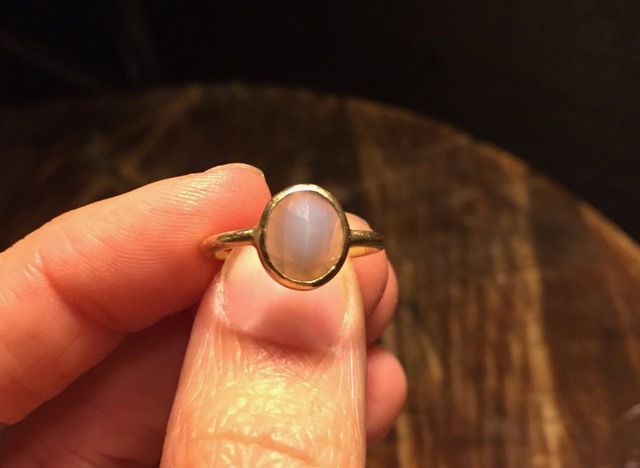 When my fiancee, Claire, and I talked about getting engaged, we dreamed about how cool it would be to make the engagement ring from scratch from a gem we found ourselves. 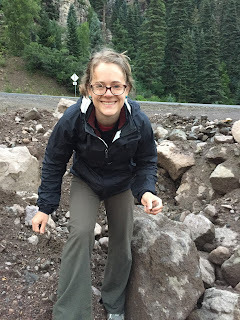 We never really thought that it was possible, but for some crazy reason, Claire let me plan a trip to Colorado's mineral belt to see what we could find. This is the story of how we just got plain old lucky despite not knowing what the heck we were doing. In a lot of ways it's a perfect way to sum up just how lucky we've been to have found each other too, even though we never could have believed it would happen. Believe it or not, there's still an abundance of gemstones just waiting to be found out there. 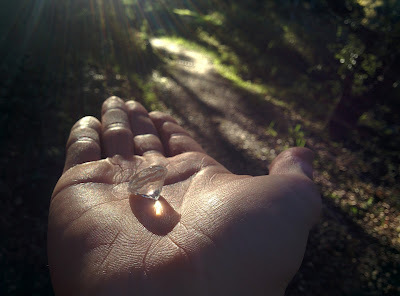 As an example, just the other day I found this beauty while I was out on my run on a trail around Burlingame, CA. Just kidding. That "gem" was plastic, and truth be told it's a heck of a lot harder to find a gem than going for a jog in a crowded suburb. But then again, that's kind of the point: rockhounding is a great way to get into the less travelled parts of the great outdoors. 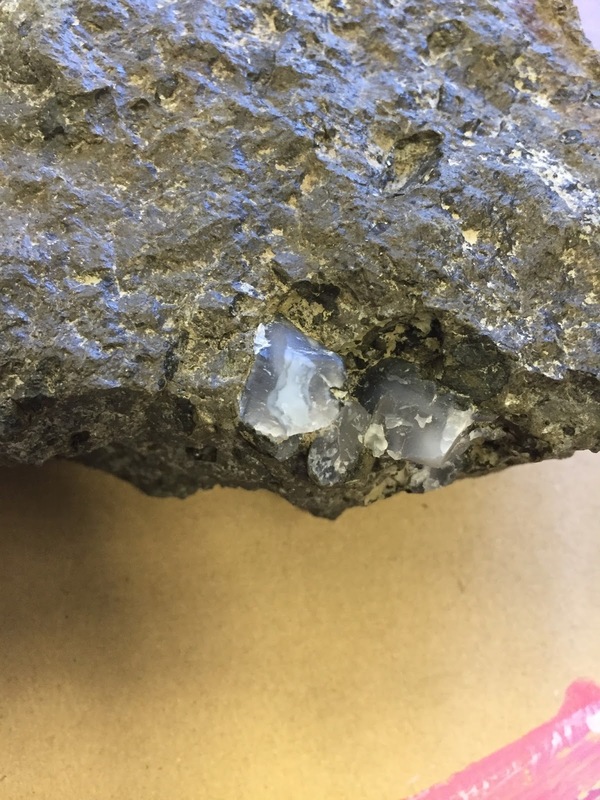 Rockhounding is another word for amateur geology. 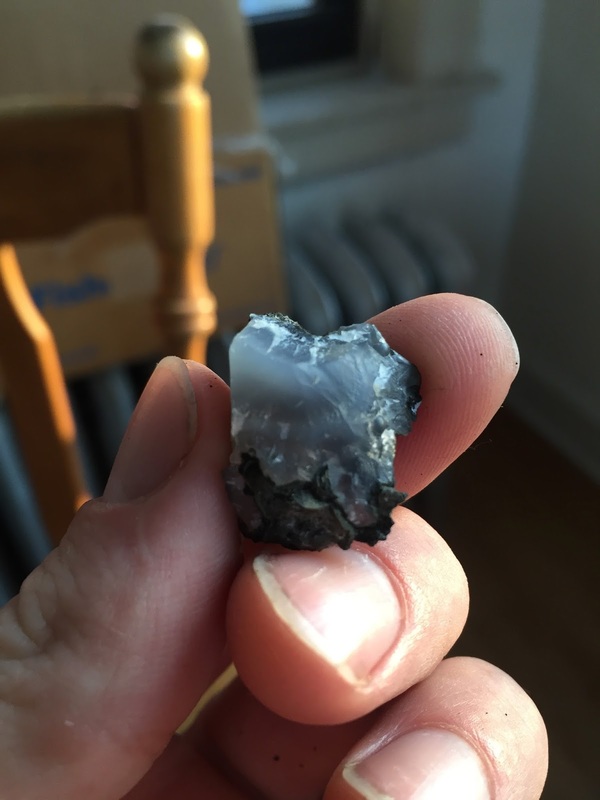 Yes that's right, regular people are capable of finding interesting rocks and gems. Toward the middle of the 20th century, there was a surge in the popularity of recreational rock and gem collecting in the US. There are still many areas in the US where amateurs will try their luck, but the widespread popularity of gem collecting seems to have ebbed substantially since its heyday. Because minerals are a fundamentally limited resource, it can be tough to find the best spots. Most material on the internet is fairly sparse and tough to interpret, but the Bob Loeffler's peaktopeak website has done a really great job of collecting and mapping many mine sites around Colorado. Another great resource for rockhounding sites was the Colorado Rockhounding by Stephen M. Voynick. In addition to ultimately leading us to the sites where we had the most luck, this book also gave us some context to understand the history of Colorado's mineral belt. 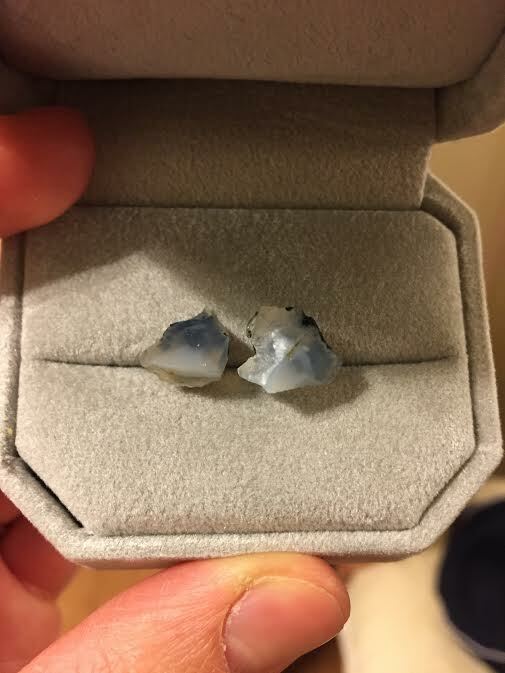 Yes, it sounds too good to be true, but we found the gem that I proposed with at Treasure Falls. We were up in the clouds looking in the rock piles below this area where road crews had blasted through the side of the mountain. Our rockhounding book suggested that these were really great places because they offered freshly exposed rock that hadn't been picked through already. This was basically the first site that we spent a lot of time investigating. 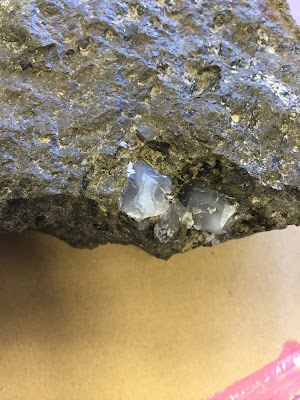 From the beginning, we found many pretty rock in the rock piles where the rubble was collected, but none of them really seemed to be gemstones at all. Claire stayed in the rock piles while I ventured out closer to the exposed side of the mountain nearer the road. As I was looking through that region a lot of small rocks kept falling down towards where I was searching, which was a little nerve racking. Eventually, I found what looked like a black meteor, broken into three parts, with a little purplish-clear nugget right in the center. I rushed back over to Claire carrying the rock. I knelt down in the mud around the rock piles she was searching in and presented her with 15 lbs. 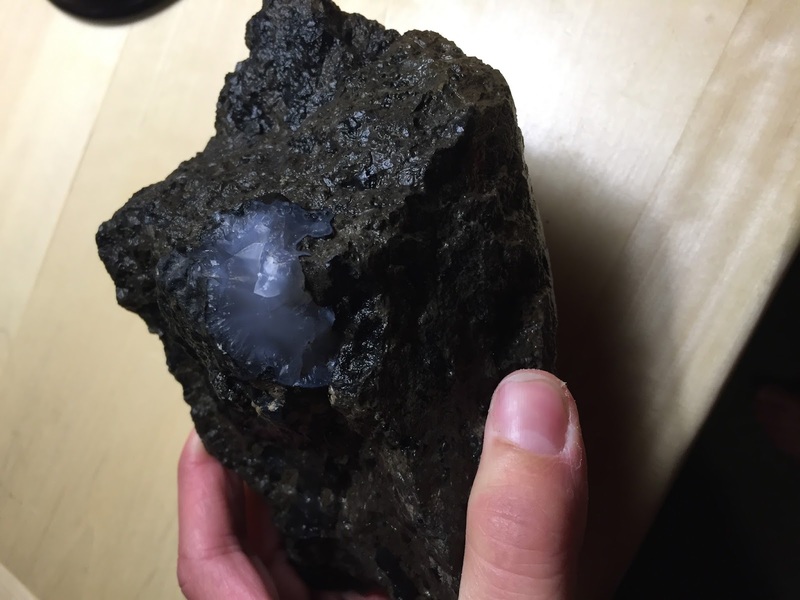 of rock with a golf ball-sized smoky quartz in the center. Then I asked her to marry me, and she said yes! She was blown away that I'd found something. To tell the truth, she had kind of been doubting that this little adventure would turn up anything. I thought we'd find something, but I never thought we'd find something quite that large and beautiful. After spending the whole rest of trip trying to find any more interesting rocks and gems, we never topped that first find. Claire and I have decided we're hooked on rockhounding. 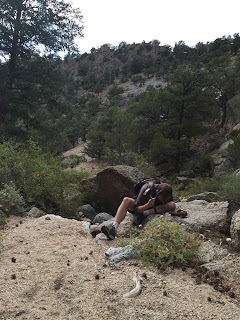 Searching for something really focuses your senses and helps you to take in the details of your surroundings to a level that you sometimes lose during a long day of hiking. 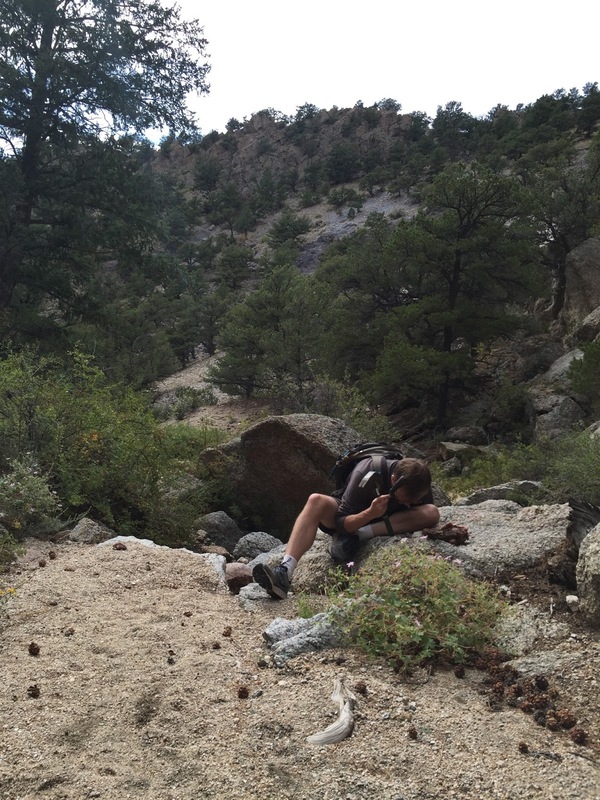 Collecting rocks (or plants for that matter) can be a great way to motivate you to keep going that next little stretch of trail. I'll never forget one of our best hikes at high elevation surrounded by these old abandoned mine shafts. 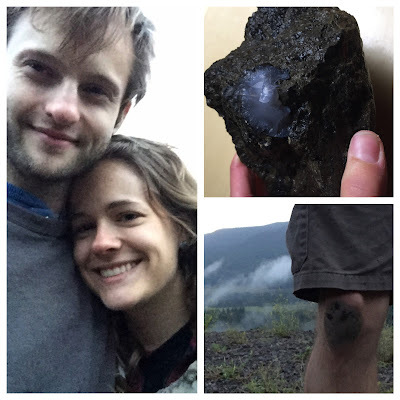 We didn't find much other than a little silver, but we kept going up and up the mountain in a chilly rain, carrying heavy chunks of rock until we just couldn't make it another step... and then we had to get back before dark. 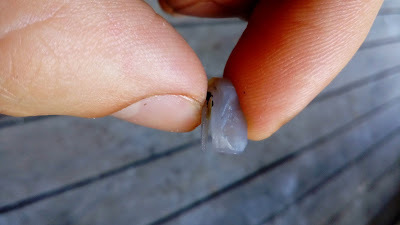 Rockhounding is really an adventure, and I suggest it if you're into hiking off-the-beaten-path kinds of places. To be honest, when collecting, Claire and I really just looked for shiny things and carried back anything that looked pretty and interesting. To learn what we had, we brought our haul into the Colorado School of Mines Geology Museum in Golden, CO. The museum curator was nice enough to go through our minerals and gems with us. 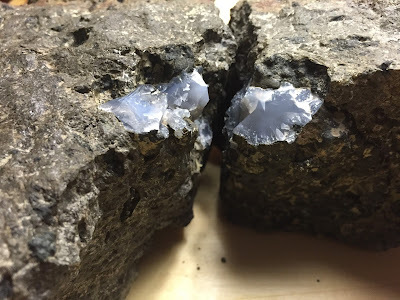 This was where we learned that the geode I'd proposed with had been an agate or a cryptocrystalline quartz. 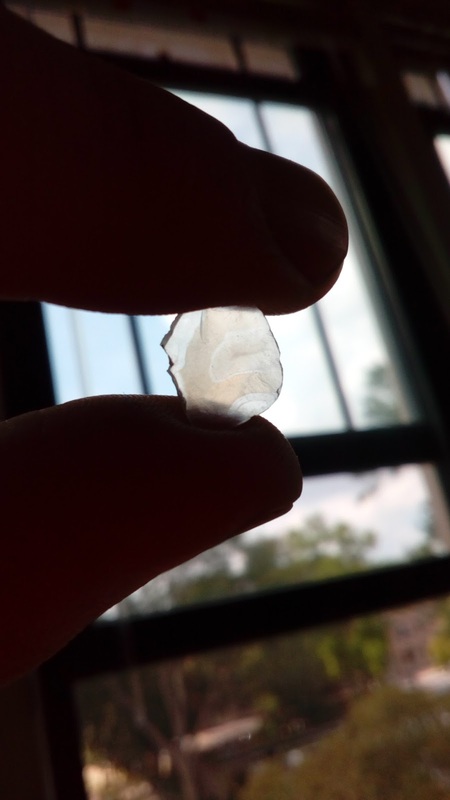 Being a quartz means that it is composed of silicon and oxygen. Cryptocrystalline refers to the fact that the silicon oxide doesn't form a perfectly repetitive crystal, but instead there are many mini-crystals that aren't quite perfectly aligned. 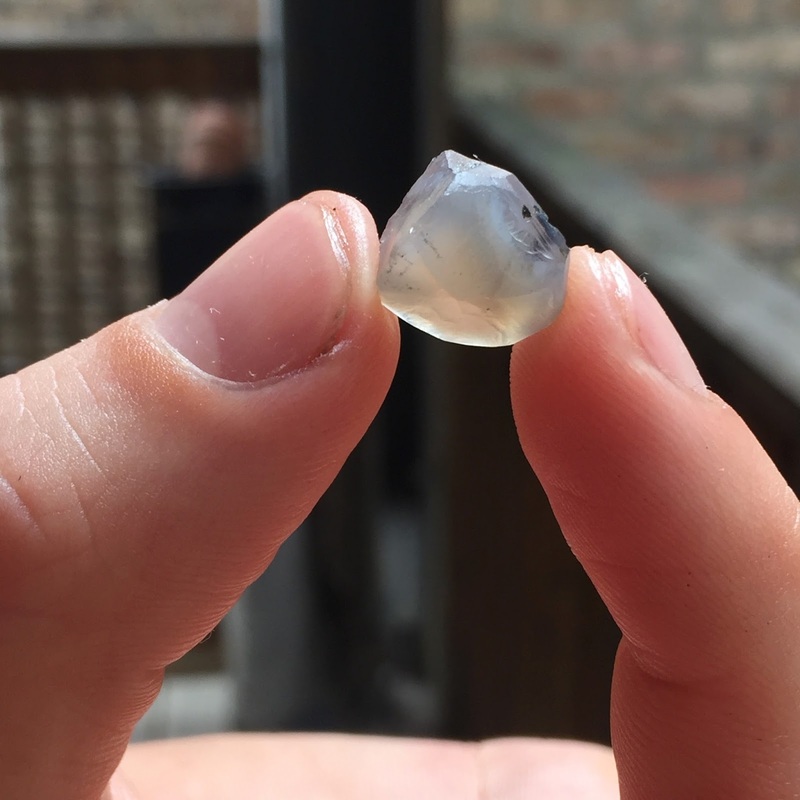 It's relatively common and not normally considered a precious gemstone, but that doesn't diminish it in our hearts any. At first, I was pretty sure that I could shape a part of the geode into the faceted stone for Claire's ring myself. 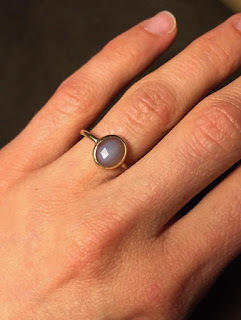 We found a smallish section with some oblong agate-like rings that we chiselled away from the darker stone to make the ring. 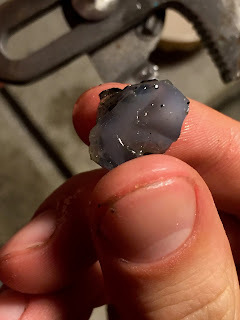 With the chunk that came out ther was still a lot of work to do to remove the excess debris and shape it into a decent chunk for faceting and polishing. 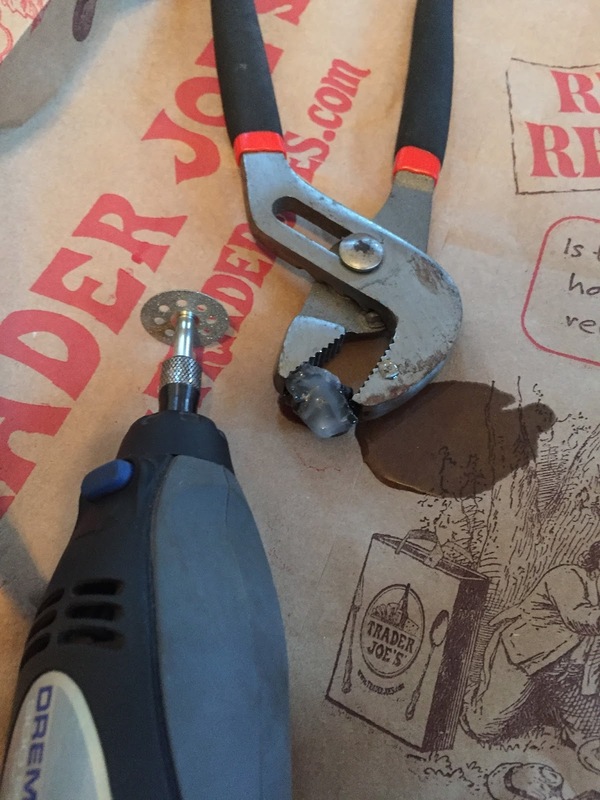 I spent a whole weekend with a diamond edged Dremel slowly carving down the piece to get it close to the right size. Based on a few mediocre references I could find online, I held the stone in place just with a pliers and cut into the gem surface at right angles to keep it from slipping. I used mineral oil for the lubricant to keep the dust down and make the cuts cleaner. I was a little bit over-the-top paranoid about silicosis. 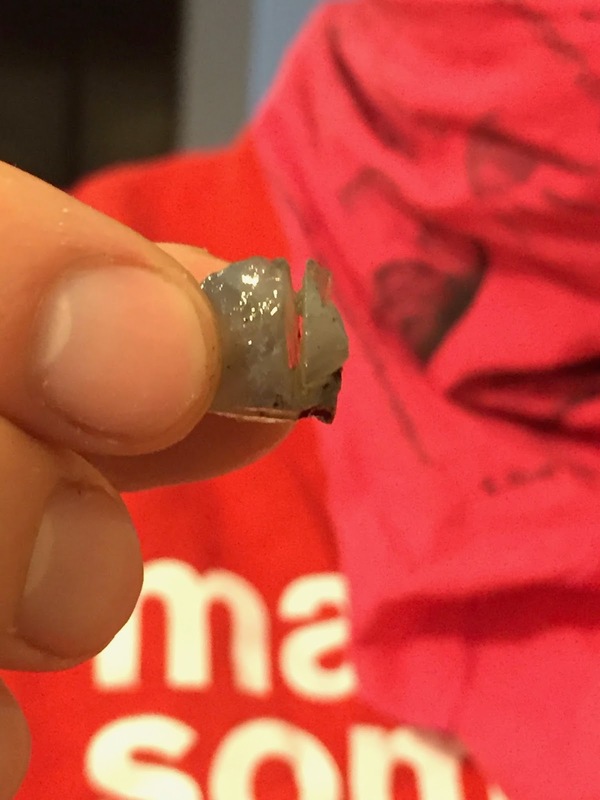 In general, exposing yourself to quartz dust is a bad idea, but in all honesty for a project this size, it really wasn't any big deal. 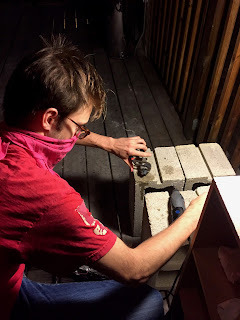 With the main chunks off, I started carving off the last bits of black rock with the edge. This also worked well for getting a roughly rounded circumference at the size we wanted. At this stage, we spent a bit wondering whether we wanted to keep the stone in this sort of natural state. We liked how the stone had naturally broken to produce that interesting little peak, but ultimately, we decided we'd want to get the glossiness that could only come with a polish. And that just wouldn't be possible without getting the surface faceted. Just for fun, I tried cutting a flat little piece of the excess off as an experiment to see what the material looked like in thin segments. I smoothed it down as much as possible. 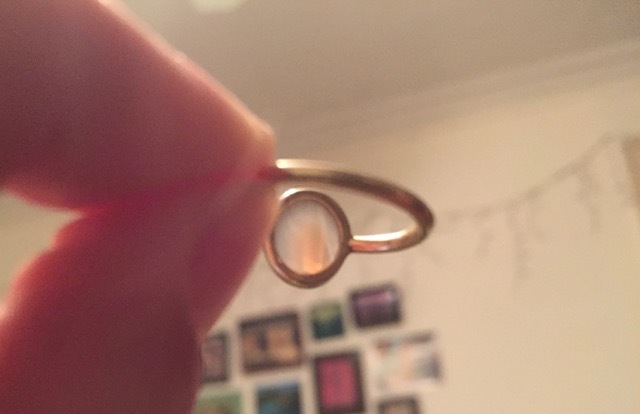 It ended up looking like a little glass (which it is) with some interesting swirling imperfections in it. 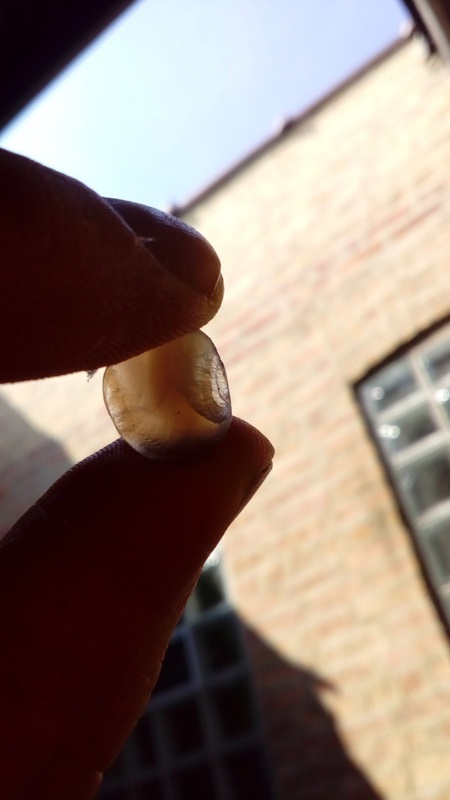 Ultimately, I wasn't able to get a good enough polish on the stone surface to really make the stone shine. Claire also wanted a rose-cut facet, which is generally considered to be a fairly difficult cut. 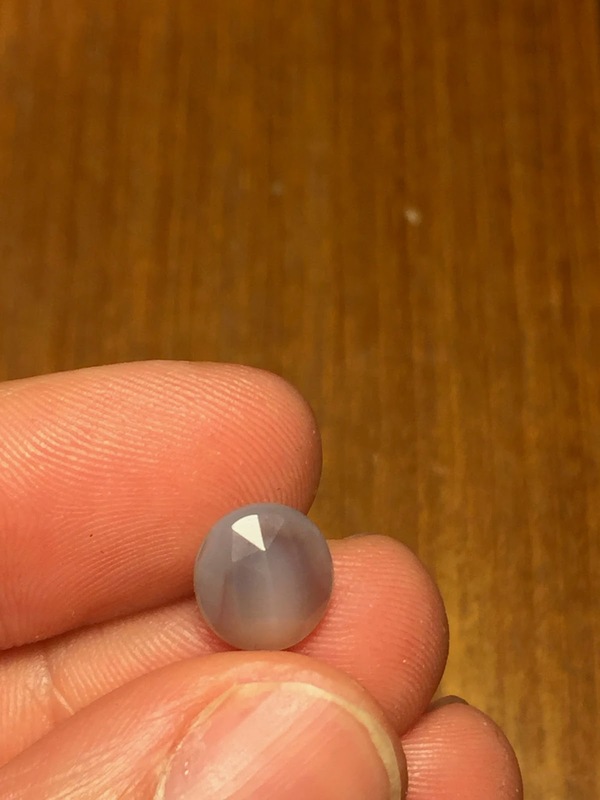 I was nervous that my faceting wouldn't be quite good enough since I'd never had any practice before. Ultimately, we decided it would be better to let a professional do the final cut and polish. There aren't that many lapidaries who will take custom jobs from individuals anymore. Fortunately, we were able to track down a nice gentleman from Kentucky named John Wright. 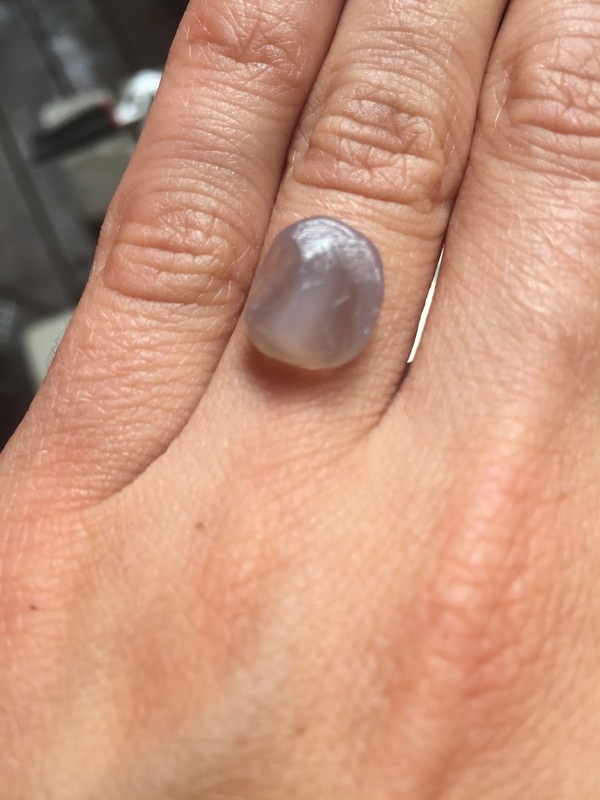 We sent the part of the stone that I had shaped down to a rough cut, and John sent back a polished rose-faceted gem just a little over a week later. 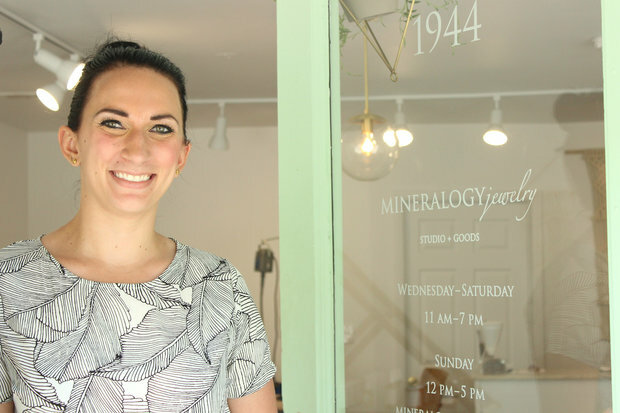 Claire had found some inspiration from Mineralogy Studios in Chicago's Ravenswood neighborhood. 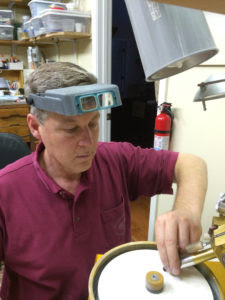 We went and met with the owner and jeweller, Theresa Cowan, there to find out what kind of mounting we could do. Theresa was wonderful to work with. 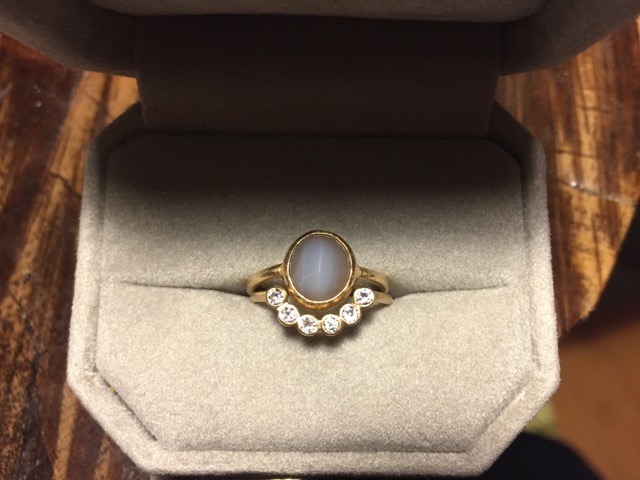 She was very knowledgeable about gemstones and totally game to work with us on our unusual project. Claire liked the look of some of Theresa’s rings, so she gave us the exact measurements of the stones in them (length, width, height etc) to make sure we could tell the lapidary exactly what we wanted. 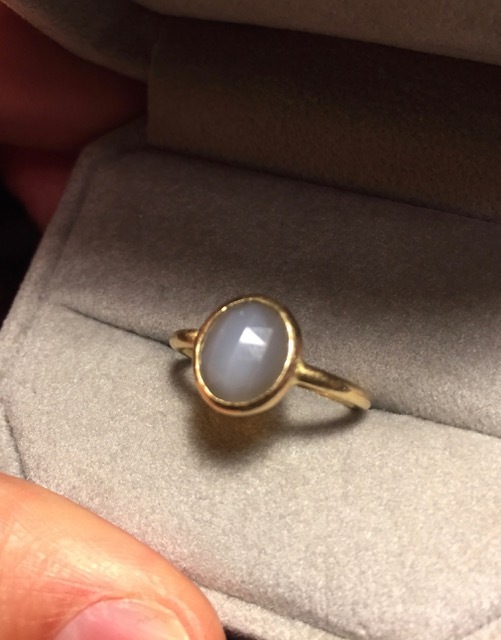 Then Claire brought in the final stone and Theresa worked her magic to produce the perfect ring. Claire was thrilled with the final product. It was the classy without being over-the-top. We also asked Theresa to make Claire’s wedding band with diamonds from her Great Aunt. We can’t wait to make it official this fall! 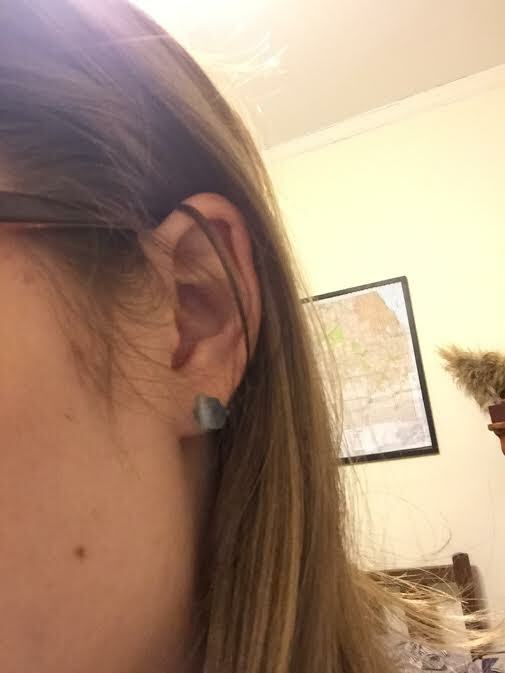 Collected some fragments from the original stone and turned them into earrings for Claire's mom.